NORTH EASTON, Mass. 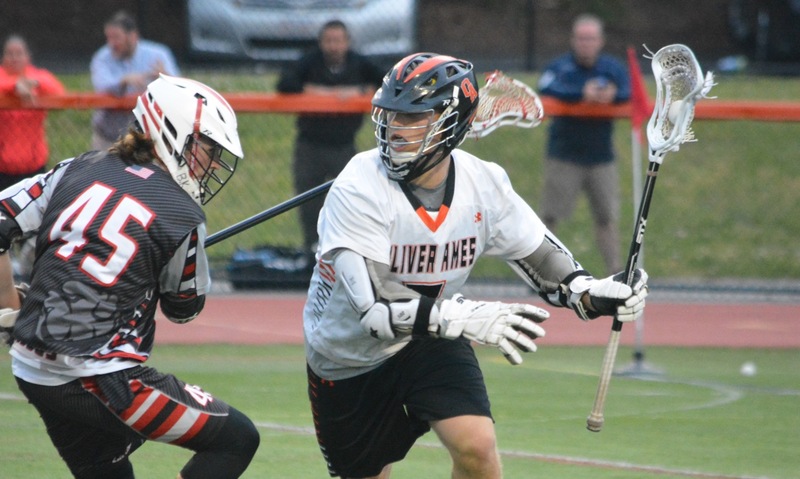 – Oliver Ames is in the midst of the program’s best-ever season, finishing the regular season with 12 wins, but the Tigers were not content and went into Tuesday night’s Div. 2 South first round game with Old Rochester at Val Muscato Stadium looking to add another chapter to and already successful spring. The Tigers turned to the youth on its midfield to keep the season alive. 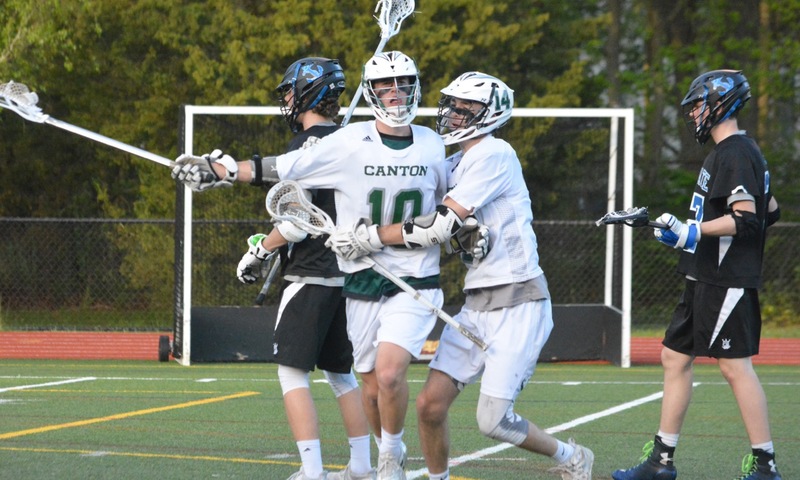 Sophomore Frankie Ireland scored five goals and classmate Shane Kilkelly added four more in their first playoff games, leading OA to a 14-10 victory and a spot in the quarterfinal. Ireland got the Tigers off to a strong start with four goals in the first half, including a hat trick in the second quarter, and Kilkelly stepped up with four goals of his own in the second half. The Bulldogs failed to contain either player one-on-one and OA took advantage of Old Rochester’s desire to press the attackers high up the field. The sophomores added to the attacking prowess of senior Eric LeBlanc, who scored three goals and recorded three assists on Tuesday. The program’s first player to score 100 goals in his career drew a lot of attention from the visiting defense, but the Tigers showed that they can provide a balanced attack. Ireland got the scoring started in the first quarter when he found himself all alone on the edge of the crease and Colin Bourne picked him out with a perfect pass. The lead was doubled two minutes later when sophomore Sam Stevens had his shot saved but another sophomore Sandro Masciarelli scooped the rebound and finished. After scoring twice in the opening three minutes, the Tigers would fail to find the back of the net for the final nine minutes of the quarter. Masciarelli had a good chance in transition that was saved and LeBlanc saw a shot tipped onto the post by Old Rochester goalie Nathaniel King. The Bulldogs scored twice to tie the game after one. A minute into the second Kilkelly received a pass from LeBlanc and ripped a lefty shot under the bar to give the Tigers back the lead. After a tying goal from the visitors, Ireland twice got free cutting across the middle and found the net with lefty shots to put OA ahead for good. After the Bulldogs cut the lead to one, Ireland scored for the fourth time with another shot on the run. In the closing seconds of the half, Cullen Gallagher forced a turnover and scooped the ground ball. The junior long pole took off up field and fired a pass to freshman Remi Creighton, but the shot was off the post. On the restart, LeBlanc took it himself dodging from the ‘X’ and finishing to make it 7-4 at the break. “None of those guys started a varsity game before this year so they’ve come a long way and they’re playing really well right now,” said Devlin of his defensive unit, which limited the Bulldogs chances in the first half with accurate checks and aggressive play in the passing lanes. Mark Vaspollo, Shane Murphy, Matt Saba, and Gallagher were consistently making plays on the defensive end. OA broke the game open in the third quarter and it was Kilkelly that sparked the attack, scoring three times. The first goal was a rocket to the top corner and the second came off a one-on-one move where he left his marker behind and finished with a bouncing shot. The lead could have been much bigger if not for the play of King, who made 17 saves for the Bulldogs. 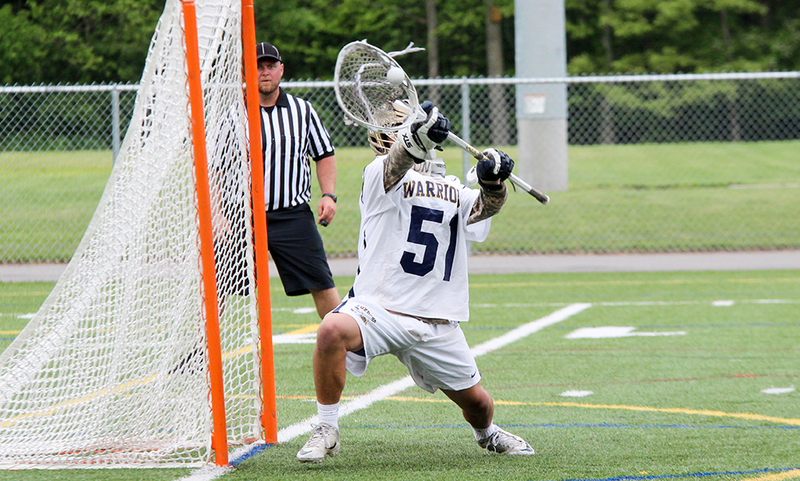 In one sequence, he made a save on Bourne and then somehow recovered to stop Hunter Costello’s rebound effort and watch the follow-up from Spencer Kligman hit the post and stayed out. Old Rochester scored on the break, but Kilkelly ensured the Bulldogs would not gain momentum with a spin move on the edge of the crease that freed his hands for his fourth goal of the night. LeBlanc again scored in the final minute of a quarter and made it 11-5 heading to the fourth. Kilkelly started the final quarter by flicking a pass to Ireland, who went behind his back for his fifth and most impressive goal of the night. OA was inches from another when goalie Nick Gillis made a save and quick outlet to Jack Lang to start a counterattack. The ball was advanced to Creighton and then Owen Gallagher alone in front but King saved it and the rebound bounced off the bar. Gallagher would get on the score sheet to make it 13-6, but the Bulldogs scored two in a row to stay alive. LeBlanc completed his hat trick from a narrow angle, squeezing the ball into the top corner to push the lead back to six. Old Rochester kept coming, scoring twice more to make it a nervy final couple minutes and provide a learning experience for the Tigers on how to close out a game. Oliver Ames (13-6) will travel to fourth-seed Plymouth South in the quarterfinal on Thursday afternoon.